This game was played a couple of weeks ago but I only just got round to uploading the pictures! The French army, with a small Reichsarmee contingent (a la Rosbach) deployed in open ground at the end of a valley, the weaker Reichs troops hiding behind a wood and hill on the right. while the left, facing the hidden Reichs troops was mostly infantry, with a single regiment of Dragoons and 5 squadrons of hussars. The French horse panicked and withdrew behind a wall of Swiss mercenaries, who were unimpressed and proceeded to fend off the Prussians for the remainder of the game. On the Prussian left, the Reichsarmee, after firing a couple of artillery rounds at the advancing Prussian hordes, fell back from their hill and set up a shorter frontage anchored on the woods further back. Seeing the flanks being attacked, the French infantry in the centre attacked the weak force facing them, but barring a regiment (which gave the advancing French a very bloody nose) the Prussians marched rapidly to either flank, leaving the French advancing into a void. The battle though was to be decided on the French right, where true to form, the Reichsarmee infantry - despite having the excellent Hesse-Darmstadt and Blau Wurtzburg regiments in the front, backed with Franconian militia, broke and fled before the first volleys from the Prussians. Seeing the hopelessness of his position, the French commander - seeing another Leuthen looming decided to leave the battlefield. Neither side took massive losses, and was won by manoeuvre. Perhaps the Prussians had a Condottiere in command!! The scenario involved a local Samurai Lord visiting a vassals (Hatamoto) village with 2 retainers (Hatamoto) and their retinues being attacked by an Ikko-Ikki (Warrior monk) raiding party. 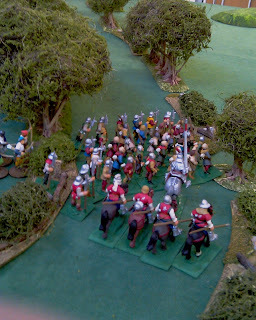 A light force was on either wing with the main body attempting to assault the village in the centre. The Ikko-Ikki advanced rapidly toward the village. The first body to engage was the Ikko-Ikki right wing, composed of a small group of Warrior monks (Sohei) supported by several groups of armed peasants and some Arquebusiers. Having crossed the river earlier they eschewed a long range firefight in favour of a sudden charge. The Samurai in the village detached the majority of their force to face this initial attack. They initially tried to break up the attacking Ikko-Ikki with Arquebus fire, but this was quite ineffective and soon they were in a fierce fight at the barricades. At one of the gaps, the Ikko-Ikki commander threw waves of peasants at the defences, before committing himself to the attack when these assaults began to fail. In the centre, a smaller group of Yari armed Ashigaru held a barricade in the face of a larger group of Sohei supported by peasants, archers and Arquebusiers. These, finding the bridge undefended, streamed across and attacked the defences. Once again the Samurais fire had little effect, and the Sohei leading the attack smashed through the barricades and began to push back the defending Ashigaru. On the Ikko-Ikki left a small group of peasants and armoured archers probed the rear of the village via a minor ford , and the Hatamoto facing them stayed in cover to avoid the shooting of the archers. Once the Ikko-Ikki were across the river, the Hatamoto attacked fiercely and in a bloody fight wiped out the attacking group. Not needing them, he allowed a small group of his Ashigaru to support the weak centre (see above) with Yari and shooting from their arquebuses and bows. 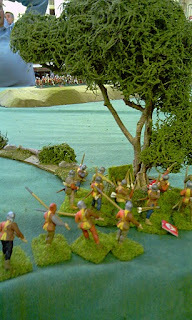 The Ikko-Ikki right now began to collapse and the samurai facing them pushed forward to surround an annihilate them. Soon the commanding Hatamoto felt confident enough to send the majority of his men to support the retreating centre. The Armoured Samurai fighting the Ikko-Ikki lords group eventually broke the peasants they were fighting and rushed the Armoured Ikko-Ikki commander. Everyone expected a tough fight here, but in the first attack the Ikko-Ikki commander lost his head – literally! Seeing this, and with their flanks being attacked by the victorious Samurai on either wing, it was not long before the Ikko-Ikki began to fall back and leave the field. The Samurai losses were minimal, and the Hatamoto were greatly honoured having won so decisively in the sight of their Lord! Figures: all Perry and Museum miniatures. Pictures: by Lawrence and Richard.